Nancy Zieman touched the lives of millions as they stitched alongside, or simply tuned in to watch, the inimitable Nancy Zieman and guests on Public Television’s longest-running sewing show [35 years], Sewing With Nancy. For the first time ever, Richard Zieman shares an intimate look into life with his beloved wife of 40 years, Nancy. Just like all of us, at times Nancy endured seemingly impossible circumstances and challenges. Richard shares insights into being a caregiver, and the blessings of support from family and close friends, during the almost four months Nancy was in Hospice care. Readers learn the physical battles Nancy faced, especially during the last five years of her life, while always retaining her faith and rising above it all. Included within the book is a DVD showing Nancy’s life and the vitality in which she lived and how we all should remember her. A moving and inspiring account of an unexpected journey with life’s final challenges. — Deanna Springer, Vice President of Marketing, Nancy Zieman Productions, LLC. Please join us for a blog tour with a few of Nancy’s friends. Visit each blog posting, on the scheduled date, and read book reviews, insights from featured bloggers, and sign up for book giveaways! Posts will be live by noon CST. Nancy left us on November 14, 2017, and almost immediately people began requesting the story of the final years of her life. One might expect that those five years were filled with sadness and pain—and there was a lot of that—but in those years Nancy also kept looking and planning for the future. She never stopped dreaming or creating. As Nancy’s life on earth neared its end, she made every effort to make it possible for those of us who remain to move on without regrets. She cleared the slate of any unfinished business with family, friends, and colleagues, leaving nothing to stand between herself and those she loved. She helped us move closer to God and enabled us to face ourselves and our coming loss with grace and dignity. Soft cover, color photos throughout, 80 pp. 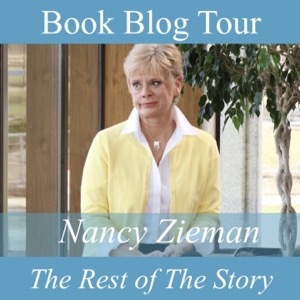 For a chance to win a copy of Nancy Zieman the Rest of the Story–A Memoir of Faith, Family and Friends by Richard Zieman, please visit the blog tour stops above, leave a comment on each blogger’s post, then stop back here and leave a comment below. The varied topics discussed and demonstrated on Nancy’s show were inspirational to quilters, artists, seamstresses, tailors, hobbyists, etc. Her show was a joy to watch. Nancy was an incredible lady. She is missed by all. I watched Sewing With Nancy for many years. I always learned something new from her shows. If she used a new notion or tool I knew it was a good one to buy – and buy I did! ha! She touched so many lives. Its nice that her husband has written this final book for us. I discovered Nancy’s show in PBS when I was a beginner sewer. Her calm demeanor helped give me the confidence to try sewing clothing, pants and shorts, something other than simple curtains and table runners! How wonderful to have a loving husband who supported Nancy all those years and took the time to write a book about her legacy. So happy to hear a book was written about her by her husband… what a wonderful tribute to an extraordinary woman! I was so delighted to meet her in real life in Paducah in 2009! Honestly, because of this site, Nancy still is touching us today. What a legacy she gave to the world. It was great to read the stories from all the bloggers of the times they met Nancy or worked with her. And I learned that there is one more fabric line coming out that Nancy designed! I’ll need some of that for my quilt made from only Nancy’s fabrics. I’m so glad this website continues to be available to re-watch Nancy’s shows. Nancy was a beautiful lady with such a kind spirit. She made every guest feel valued, and presented great projects. I learned a great deal from her, and am so sad that she is gone! I pray for her family, as one who lost my husband to cancer after a thirteen year battle. God Bless You All!!! Thank you for the opportunity to continue to learn from one of the best. Nancy was a wonderful teacher. Blessings to her husband, family & friends. Thank you for this beautiful giveaway!! Her teaching never ends!!! Nancy inspired me to sew about 24 years ago. I learned some basic machine sewing skills from her and taped some of her episodes. She was a good teacher, and I wish over the years I could have watched her show, but we don’t have tv. I look forward to reading the rest of her story. I learned so much through the years watching Nancy on television. She was so knowledgeable and that she was a kind and giving person resonated through all she did. She is missed, but there are wonderful memories! Miss my sewing teacher and my long-time friend. I would love to win a copy of this book and learn more about this inspirational person. I wept when I read of Nancy’s illness. And bawled when she left us. I so wish I had been able to meet her. She has been such an inspiration to me. I feel like I lost an old friend. What an inspiration she always was. Loved watching her show. Such an inspiration. Nancy was a fabulous teacher and it was wonderful that she was on free public television. I am so delighted to know that she is a Christian and therefore I can actually meet her on the other side of eternity. I most appreciated how she showed us to alter sewing patterns so that clothing fit properly. May her family have the peace that passes understanding in this difficult first year anniversary coming up. Such a loss for the swing community. I have saved many of her shows on my DVD so I can watch them whenever I want or need to. I love Nancy. She taught me to sew sew when I couldn’t leave my house and it was her and Perry Mason that kept me sane. Loved watching her programs. An inspiration to all. I became aware of Nancy by YouTube chance and began using her as a talented and inspirational resource for my quilting and sewing journey. I quickly came to admire her so much, never moreso than when I read her address to her audience telling of her recent diagnosis, bleak prognosis and decision to dedicate her last little time to family and faith. A truly wonderful inspirational woman. I just loved my time watching Sewing with Nancy and learned so much from her. She is truly a mentor to so many. You are missed Nancy. I have admired Nancy for so long. She was such an inspiration in so many ways. Thanks for sharing! I have watched her programs for years and gotten a lot of ideas and tips. I starting watching Nancy as a young teen and love the show. I learned a lot and have som of her books. Memories of Nancy warm my heart because they bring to me memories of my Mom. I grew up with my Mom “sewing with Nancy”. I have some of her sewing books as well – by Nancy of course! Sewing with Nancy covered such a wide variety of information. The show was always very classy. I looked forward to Saturday mornings with Nancy. I have been watching Sewing With Nancy every week since I started sewing in 2007. I love all of her programs on quilts but my absolute favorites are her series on Landscape Quilting. I’ve watched those numerous times. Nancy will truly be missed by everyone in the sewing community. I have been to each of the blog spots and love reading about Nancy as view by her peers. I watched Nancy’s programs from the start. It was so educational but always had a sweet side of life that I so cared about. She made us all feel like she had taught us well and that we would love doing what she was teaching. Her book in my library would be treasured. Watching re=runs are great, just miss seeing her sweetness for us all! I loved Nancy’s book and look forward to reading this one. She was an inspiration to all! I am happy that I was able to meet her. Sweet lady!!! I remember watching Nancy on PBS. I would be so thrilled to win this book. I read Nancy’s book, which I loved. I have been watching Nancy on PBS for so long, she inspired me to sew because she made projects look easy and fun. She was like a good friend visiting in my living room. My daughters have enjoyed watching Nancy with me and it has cultivated another generation of sewers. We were blessed to have met her in Beaver Dam a few years back. Even though I was SO excited to meet her she gracefully set me at ease, and we had a few special moments. I do/will truly miss her, and am so blessed to have known her. Nancy was/is an inspiration to me. I always loved/still do her shows. I would love to have a copy of her book. I have learned so much from watching her shows on PBS. I have recently been recording them so I have them as a reference. Thanks you Nancy! It’s going to be so enjoyable to read each of the blog stops about Nancy. Looking forward to hear/reading more about Nancy’s life! Thank you. I enjoyed each of the shows that I was able to watch. I always learned something new. I was also able to see her in a show in Washington a few years ago. I was surprised to see her in the booth after the show selling and of course I bought something from her. Thank you for sharing the inspirational story of such a beautiful woman! Nancy’s shows were wonderful, so well-done and informative. I especially liked the interviews at the end and was particularly impacted with the Little Dresses for Africa segment which resulted in our quilt group making over 200 dresses to send off. Nancy was an inspiration to the rest of us. I watched Sewing with Nancy for many years, and then many different things on her blog and website. I still miss her smile and enthusiasm. Nancy was a great teacher, confident and graceful. I always loved Sewing with Nancy. Always recorded so I wouldn’t miss it! I miss her so much — she was so inspiring. I watched Nancy from the beginning – she taught me most of what I know about sewing and quilting, Used so many of her techniques over and over. Loved her show. Owned so many of her videos and watched them over and over. Very special lady – sadly missed. Absolutely love this show. I have been watching Nancy since I was a young wife. I have learned so much from her. Once I discovered Sewing with Nancy on TV I watched her shows faithfully. I loved the projects she showed and her teaching style. I miss her. She as a class act. I watched Nancy every chance I got. She is surely missed. I love any episode with Nancy but denim items are my favorite. I watched Nancy every Saturday morning for new and exiting patterns, projects and techniques. Will miss her greatly. Sewing with Nancy was my reintroduction to sewing. As a child I had been a 4-H member and worked on many sewing projects. Sewing was put aside as I went to college and joined the workforce. As a young mother I realized I wanted to make things for my daughter – and found Nancy on public television. I learned so much! I still make things for my children and grandchildren. In fact there is a felt farm set and several “cozy quilts” in progress for holiday presents. And the thanks go to Nancy for bringing me back with her straight forward, easy ways to make a hard project easy! I enjoyed watching “Sewing with Nancy” on my PBS channel whenever I had the chance to. She had so many helpful hints and project ideas. I always came away with something. I have purchased some of her patterns. Nancy was a dear, always so thoughtful, and she had a whit about her. Sure do miss her programs in our area. Nancy was a beautiful, caring and talented person, whom I greatly admired. Her caring showed on her Nancy’s corner inspiring others to give back too. And her last show with her grandchildren she was passing on her love of sewing to them. How wonderful! They have beautiful memories. May God be with the family and Thank you Nancy sharing your talent! I didn’t have a way to watch her show but did enjoy when I saw some of her videos. Very informative and helpful. I enjoyed her programs and was thankful she was on TV! Everything I have read about Nancy has always been kind and I would love to read her husbands tribute to her. I watched Nancy’s show almost every episode n the ones I couldn’t watch I recorded…have a lot of them still on my DVR. She was such a beautiful n talented lady. A very sad day when she passed. Nancy has always been an inspiration. My husband (a non crafter) even enjoyed watching Sewing With Nancy with me. A truly wonderful lady with a great deal of talent. She will be missed. I remember watching “sewing with Nancy” for many years. First when I was a garment sewer, and later as I got into craft sewing. I know her story is wonderful. An inspiration to all of us sewer. Thank you for sharing a behind the scenes book about a women who gave inspiration to so many. The patience she showed with all especially they kids series was a good example of who she was. As a young mom 27 years ago, I found Nancy on our local PBS station in Fayetteville, NC. As a result my desire to grow my sewing skills was rekindled along with learning to quilt. Nancy made everyone watching believe they could sew anything and just as well as Nancy. I would love to win these books and learn more about a very inspirational woman, Nancy Zieman. I came back to this blog by way of Pat Sloan’s blog. She pointed out how Nancy was full of grace. I named my daughter Nancy because it means full of grace. I loved watching Nancy on TV, and met her once at “Sew Expo” in Puyallup many years ago. I would love to read the rest of her story. I purchased her first book, and Nancy has been a great inspiration. Blessings to Richard in learning to live without her. Nancy had a huge impact on those of us who loved to sew. I miss her. I will forever miss my sewing mentor, Nancy Zeiman, as will legions of faithful fans. I met Nancy once and it still remains one of the thrills of my creative life. Thank you for completing the story of her amazing life journey. I’m still learning from Nancy, as I have my DVR set to record her shows. I have so much still to learn, and feel lucky that I live in this time when I can benefit from technology. Have watched Nancy all the time. She had a lot of good short cuts. Love the pivot technique to adjust your patterns. I love every program I ever watched of Nancy’s. She was amazing. I still watch them every time they are on. Loved watching her every week. She was the Mother Theresa of the sewing world. She will never be forgotten for her kindness, sharing of knowledge and so much more. Sewing may be what she taught. Life, family, character, ethics, values, love, sharing, giving, and being humble in the challenges, were how I remember and cherish Nancy. I watched Sewing With Nancy from my late teens and still watch it to this day on her website. She was a master of her craft and just this week I made two items from one of her publications that is one of many of hers that I own. I was blessed to meet Nancy several times at Sew Expo in Puyallup, Washington. I always took her lectures and loved seeing her in the Babylock booth. She was always so generous about having her picture taken with anyone who asked and autographing tickets, books etc. too. She and I even had a laugh once when I took a selfie with her “flat Nancy” poster. I never met Nancy, but when she passed, I felt as if I had lost a friend. She brought so much joy into the lives of others. To pick a favorite episode of Sewing With Nancy is impossible. Her creativity and her ease of presentation instilled confidence in her viewers that no project seemed impossible. I continue to enjoy the show as they are timeless. Nancy’s sewing was/is a great inspiration. I love her all the more for her faith and grace. I’m looking forward to this book. I have collected many quilt books and supplies over the years. I own a few of Nancy’s. I retired last year, but couldn’t quilt due to an injury that happened at my school where I have taught for 25 years. I am still recovering and managed to take 2 quilting classes this past year. Still need to machine 1uilt them. Can’t wait to try Nancy & Pat Sloan’s books. I am just starting my life into quilting at 60 yrs old. I read Nancy’s Seams Unlikely book and am looking forward to reading this next installment about her life. There are so many Sewing With Nancy episodes that I love that it would be hard to pick a favorite. Right now I am making travel bags and zipper bags for family and friends. Nancy’ episode in which she made travel bags that fit over the handle of rolling luggage is a pattern that I am using to create gifts this Christmas. Thank you for all of your help and inspiration NZP. With the challenges of now being a caregiver for my husband, working a full time job and having an adult Asperger son, I still try to find some time to watch the Sewing With Nancy show. I have my DVR set to record every episode which I watch religiously regardless of how many times I have already seen them. Nancy sewed like me and I love to watch and listen to her explain the techniques she developed and used. She has been an inspiration to me as a sewer and simply a person of faith. She will always be missed. Nancy was a wonderful teacher. I watched PBS and savored her techniques and wonderful samples that showed the steps of her garment and quilting projects. Sounds like an amazing book! I remember watching Nancy when I was growing up. What an icon she is and I would love to win so I could read her story. I have been sewing for probably 55 years and loved watching Sewing with Nancy. I learned many time-saving sewing skills and well as many advanced sewing skills from Nancy. I met Nancy several times at her annual Sewing Weekend and at the the Quilt Expo in Madison. Although I can’t say that I personally knew Nancy, I felt a deep sadness when I learned of her cancer and then of her passing. Her love for sewing and desire to share what she knew was rare. Most people these days want to share only part of what they know, but not Nancy, she seemed to want others to know what she knew and celebrated others accomplishments. She is what many may call a diamond in the rough, a true gem, and will be very missed. I was very blessed by Nancy. Seeing is my passion and my stress reliever and I learned so much over the years from her show and her books. She is gone so soon but the Lord is taking good care of her now and she is no longer in pain! She is dearly missed. Nancy was a beautiful person. I loved her smile and sense of humor. Nancy was my friend when we first moved to Fort Worth, TX and I knew no one else. We sewed together and I learned so much from her…more than simply the steps to construct a garment. Her caring corner showed her compassion for those less fortunate as well as mentoring of young women. She has touched the lives and hearts of more people than we could ever imagine. She was a very special woman. God bless you, Nancy. Nancy was courage and acceptance, love and faith and creativity. What a wonderful woman! I watched Nancy on TV and was saddened to hear of her passing. She was a true inspiration. Thank you! I have read Nancy’s book twice and now Richard’s book. I could not put those down and will continue to remember her for all that she did for the sewing industry. What a wonderful teacher she was and I have learned so much from her. She was a wonderful inspiration. I regret never having the opportunity to meet her in person. Her faith kept her strong in spite of much suffering. What a blessing she was to so many people. A few years ago I went to Washington for the Puyllap Sewing Expo and got to visit with her. She was just as lovely in person as on TV. I had the privilege of talking to Nancy a number of times at various sewing events, and she was always gracious and kind. I miss her. I had the wonderful opportunity to meet Nancy in person many years ago. Talking to her one on one was an amazing opportunity. It’s a memory I won’t forget. Thank you Richard for finishing Nancy’s book. Like you we still miss her. It is hard to look at her smiling face knowing she us gone. But what a wonderful testimony she has lived. I know I will see her again. Can’t wait to read the new book. I admired her calm and patient teaching style–she made you want to slow down and enjoy the process of what you were doing–and be proud of the result! She was a wonderful gift to the sewing world and to everyone she interacted with! We never met, but I felt I knew her. I watched her shows for most of the years she was on TV. I cried when I read her farewell letter, I felt I was losing a good friend. I have many of her books and DVDs, notions, etc. She had a very easy way of teaching, so easy to understand. My sympathy to her family. Nancy inspired me to keep sewing, even when life got busy, with her 10-20-30 minutes to sew concept. I refer to her books often and am so glad my PBS station is playing “the Best of Sewing with Nancy” every week. I miss her. When I watch Sewing With Nancy every Saturday I still cannot believe she is not standing there in person encouraging and teaching us. I believe that as long as we have the programs, she is with us. I hope PBS will always show Nancy’s programs. Thank you, Nancy, you give me courage to face what I face every day. I felt a closeness to Nancy because we were basically the same age, started sewing in 4H & unfortunately shared a diagnosis of beast cancer too. She signed the first serger I purchased. I still enjoy her program & I work with many projects from her books. She truly is missed. Nancy was like a friend I never had a chance to meet. She inspired me to learn to sew. I purchased many books and dvds written by her and various guest hosts. I started watching Nancy’s show when I was a young married woman who wanted to sew better. I had taken Home-Ec in school, but my skills were poor to say the least. Through Nancy’s show and catalog of notions and books I eventually sewed most of the clothes for myself and my daughter. We are both tall and at that time selection was non-existent in retail, so I sewed for us. Nancy was a true inspiration for millions. Nancy was so amazing. I learned so much from her. I watched her shows and followed the blog so much that I felt like I knew her personally. There are some people in life that touch you so deeply that it’s hard to move on without them. Nancy is one of those people. Her book of her life and other books on tips on my favorite. Would love to win the book. I watch and re-watch shows with Nancy, and I’m continuing to learn from her. Nancy and I had many things is common: age (13 days difference), Midwest small town childhood, 4-H, views on marriage and family life. I was privileged to meet her at sewing events and still learning from her tv shows. I loved watching her tv shows and continue to watch them. She was very generous with her tips and ideas for sewing. I have purchased many of her books after watching the show. I miss her. I always think about her on Saturday, when her show comes on. I have been watching her since the beginning. I am 61 now and she was/ is a part of my life. I know Nancy’s husband and family miss her beyond words because even those of us who knew her only through the air waves realize the world is different without her physical presence. Her faith and testimony and love of sewing will live on until Jesus meets us in the clouds. I can almost picture Nancy’s work space in Heaven where she works while looking forward to being reunited with her loved ones. I believe her courage came from the Lord and she encourages me to this day. Loved watching her show and seeing her in person at Puyallup for the Sew Expo. My friend won her prototype pin cushion for machine needles and gave it to me since I always watched her shows. What a treasure!! I just commented last night to my husband that I miss Nancy. I was reading a different author’s sewing book that didn’t have very clear explanations and the photos were hard to decipher. Nancy always made everything so clear and easy to follow. “Bye for now”, Nancy! I have enjoyed Nancy since I was young mother and learned so much from her. My sister and I both watched from our diffeerent homes and discused the program. I felt Nancy was my sisteer too. She will always be in my heart. Love you. I enjoyed watching Nancy every week. I still watch her videos. She was such a lovely lady. Miss her. About a month ago I lost my son Theodore to cancer. How Nancy faced her life and traveled on has been healing for me. Thank you! It is because of Nancy that I sew. I still have her programs oon my DVR. She is a part of me. She was a very knowledgeable person..
She was an inspiration to me. Always watched her shows. As I raised my four daughters, I looked forward to watching Nancy and became creative with her help! Nancy was an inspiration to me in my sewing life and I miss seeing her live on “Sewing with Nancy” but still record all of her episodes that are still shown on PBS. I liked the shortcuts she shared. Nancy was truly inspirational – in so many ways, and she has left a wonderful legacy. Not enough time today to visit all those blogs (preparing for tonight’s quilt guild meeting), but just want to say I watched Nancy via internet since we don’t have a television. I learned so much from her and appreciated her kind approach, soft humor and creativity. Nancy “kept me company” while I sat and nursed my 5 children. I enjoyed watching her program and learned many things from her. I had learned to sew when I was young in 4-H but learned to sew better after watching Nancy. Nancy was such an inspiration. Her creative abilities were outstanding. I still love watching Sewing With Nancy. Nancy left a large space that will never be filled. I will be looking for this book. Nancy was such a important part of my life. It was her program that instilled in me the love of sewing. I would always make sure that I watched her show, her sewing tips and the time she took to explain ways to make sewing easier became part of my sewing habits. I loved Nancy! She was the most generous TV personality. She shared her heart with passion and love with us. She encouraged us to tape her shows so we could reference them as often as needed. I have many of her books and she will always be number one in my sewing go to. She may be gone from this earth but for all sewers she will live on forever. God bless her family! Loved watching Sewing With Nancy. She taught me a lot about sewing. She was very talented and inspiring. I have to say she was brave, courageous, smart, talented, and so much more. She went through so much in her life but never gave up. A lesson we should all follow. Will miss her dearly. Will continue watching Sewing With Nancy as long as it is on the air. Love you Nancy and miss you. Be blessed her family and friends. How I wished that I had found Nancy’s show sooner. How I wished I had the chance to meet her. But how grateful I am that I grew and continue to grow from her knowledge. I still miss her daily. What a testimony Nancy has and so many lives she continues to touch today! Nancy was a beautiful lady. I bought this book and found that this woman, Nancy, was a very courageous woman. I cried through the book, imagining some of the pain that she had to endure. Her videos never showed her in pain, which she must have had, but yet made the time to film those educational videos for us. Her husband, Richard, went through a lot, too. I have the utmost respect for them both. Get the book- you’ll love it and cherish Nancy even more. A gracious, generous, Godly woman. I will miss her wonderful teaching skills. I only met her once, but she was everything I believed she was. Funny, self-deprecating, and so knowledgeable about all forms of sewing. There will never be anyone like her. She is missed. She made sewing looking easy by providing great instructions with samples! Thank you! Watching Nancy sew for all those years made me feel like she was a friend and mentor. Thank you for sharing her with us and for continuing to share her through this book. Missing my Mentor of sewing and life. I always enjoyed her sewing videos. They were wonderful. Belated Thank You Nancy.